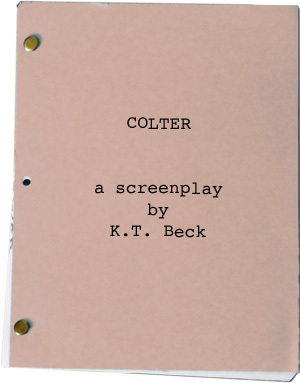 You can read and/or download Colter for free. Click here and then save the .pdf file to your computer. After a few years of near, but not actual, success in the Hollywood Whirlwind, I found myself in the midst of a lot craziness, both personal and professional. So I did what any dedicated screenwriter would do – I called my uncle in Jackson, Wyoming, and asked if I could drive up and join his construction team. And I did just that. I left L.A. behind and set to digging ditches full of river rocks, pouring concrete, and picking up many heavy things. And while hanging out in that lovely mountain town (enjoying the spectacular natural wonders therein – if you haven’t been there, go) I came across a nature documentary filmmaker. We hit it off and, since English was a second language for him, over the next few years he hired me to write the narration for a dozen hour-long pieces for PBS, the BBC, Nova, and National Geographic. Very nice! And I’m proud of our products. But the documentarian, who had done numerous second-unit photography assignments for features, had a yen to produce his own Big Time Movie. He wanted to make a film about John Colter. The name of John Colter looms large in the Jackson/Yellowstone area. A hunter/guide with the Lewis & Clark Expedition, Colter remained behind when they returned to the East. He had many adventures, helped build trade agreements with Native Americans, and left his name on everything from rivers to valleys to street names in the Yellowstone area. I first heard of John Colter via a Disney film Westward Ho The Wagons wherein Fess Parker sang a song about Colter’s escape from the Blackfoot tribe. I agreed he would make a terrific “outdoor” picture. As I researched the facts around Colter I found him to be a near perfect historical figure to write a fact-based feature about. Basically, he lived through several amazing and hair-raising events and feats, but despite the fact that they are all documented, there is very little detail in the historical record beyond brief descriptions of what happened. For example, there is no record of John Colter’s love life. But, one way or another, I’m certain he had one. So there is a romantic interest. Read the script and see if I served that idea well. I like to think I did. If someone were to make this film I will owe an apology to the descendants of George Drouillard. I needed a villain for the piece and I made him one. He was also a hunter/guide with the Expedition, and well regarded in the Journals. Why did I choose him to the villain? While the Expedition Corps was still preparing for their trip to the West in St. Louis, Colter and Drouillard got into a fight and both were disciplined. No further animosity shows up the Lewis & Clark Journals, but that fight was enough for a writer to expand into a rivalry with some nasty results. My apologies to the memory of a guy who probably wasn’t exactly the kind of man I invented. The other thing I would like to make clear is why much of the English dialog spoken by Native Americans in the script is of the “monosyllabic, no contractions” category that can sound impolite at best and racist at worst. As I wrote their lines I was aware of the fact the English was a second (or third or fourth) language to many of these people and I wanted to reflect that. If this story ever got made I would hope that the producers would hire some experts in the cultures of the various Native American tribes described in this story and correct my place-holding mistakes. I am no expert in that field and don’t pretend to be. I tried to be respectful, realistic, and sensitive to these peoples and hope that my liberties and mistakes will be cleared up. If you have read this far, stop now and direct your energies to the script. I hope you enjoy it.